For Immediate Release: Posted On 6/10/2009 By Industrial Magnetics, Inc.
Industrial Magnetics, Inc. announces their new, Self- Cleaning, Pneumatic Line Housing for magnetic separation in dilute-phase pneumatic systems. An industry first, this self-cleaning unit is designed specifically for pneumatic line applications. 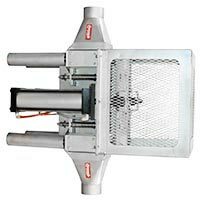 The sealed unit eliminates line pressure drops and surges, is leak-proof up to 15 PSI and the self-cleaning feature eliminates the need for operator-required cleaning of metal contamination. Based on its highly successful Drawer-In-Housing platform, the Pneumatic Line Housing from Industrial Magnetics Inc. incorporates a series of 1 in. dia., 50MgOe rare-earth, Nedox® coated tubes on staggered centers, versus a single, center-flow cartridge circuit often prescribed for pneumatic line systems. This configuration ensures that all product flowing through the housing makes repeated contact with the magnets. The resulting capture rate of ferrous and weakly magnetic stainless contaminants far exceeds any other magnetic separator available for this type of application. Ideal for horizontal or vertical orientation in dilute-phase pneumatic systems, the Self-cleaning, Pneumatic Line Housing is suitable for processing dry, powder, and granular materials. The Nedox® coated tubes provide protection from abrasive particulates and corrosive materials and assist in keeping product with bridging and clogging tendencies from adhering to the magnetic tubes. The Pneumatic Line Housing can be used ahead of processing equipment and bulk load-out stations to ensure product purity and protect machinery from tramp metal damage and is also available in a cart mounted design for portable bulk unloading.